The rabbi was Mendy Goldstein, co-director of Chabad of New Zealand. “We cannot overestimate the value of every hug, every gesture, every hand extended in support,” he told Chabad.org News after the ceremony. Goldstein was part of a delegation of local Jewish community members who travelled to Christchurch, on New Zealand’s South Island, last week to help console and support a bereaved Muslim community still reeling from the massacre of 50 worshippers at the Al Noor Mosque and Linwood Islamic Centre during Friday prayers. Although there had been interfaith ties between the Jewish and Muslim communities, including visits to each other’s synagogues and mosques, before the massacre — which New Zealand Prime Minister Jacinda Ardern called one of her country’s darkest days — overall the communities tended to live mainly separate lives. But the attacks have galvanized a new level of connection — and a shared sense of vulnerability: Following police advice, New Zealand’s synagogues were closed for the first time ever on the Shabbat of the attack. “If there’s anything good that can come of this atrocity, it’s that it will bring our two communities closer together and that, importantly, we work together to defeat the terrible scourge of white supremacy,” Moses wrote. 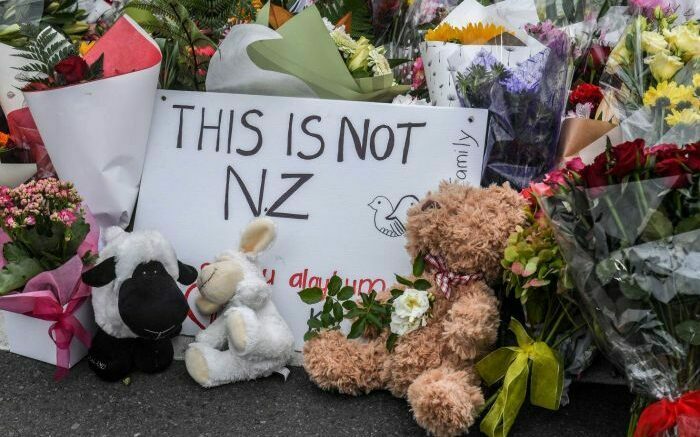 New Zealand’s Jewish community has been fundraising to offer financial support to victims of the mosque attack and the local Muslim community. It has also partnered with the Jewish community of Pittsburgh — where a white supremacist attacked the Tree of Life synagogue last October, killing 11 worshippers — and the American Jewish Committee. New Zealand has seen an outpouring of unity and condemnation of hatred following the March 15 massacre, which made a speech at an anti-racism rally in Auckland last Saturday especially jarring. Ahmed Bhamji, a leader of the Masjid e Umar mosque in Auckland, said he suspected that Mossad might have funded the attack. “I stand here and I say I have a very, very strong suspicion that there’s some group behind [the shooter], and I am not afraid to say I feel Mossad is behind this,” Bhamji was recorded saying. There were about 1,000 people at the rally, yet no one, including at least one New Zealand lawmaker in attendance, called out Bhamji’s remarks. Both New Zealand’s Jewish and Muslim communities have common roots as refugees and immigrants. The South Pacific nation of some 4.5 million people is home to about 46,000 Muslims (based on 2013 census figures), mostly from South Asia and Iran, with others coming in the last 20 years from war-torn countries such as Somalia, Bosnia, Afghanistan and Iraq. There are nearly 7,000 Jews in the country (the majority in Auckland and Wellington), some whose families came as refugees from Nazi Europe; more recent arrivals include Jews from South Africa. This article was written by Dina Kraft and originally published in Haaretz. It is reproduced here with permission. To really understand Israel and the Middle East – subscribe to Haaretz.